So how, in 2014, after years of imitation and several pop music generations long gone, would a new Aphex Twin album hold up? As it turns out, damn well. The beauty of Syro is how efficient it is, how it consolidates all of James’ strengths, touching on everything from rubbery funk to soothing ambience to slippery drum’n’bass, without losing his energetic inventiveness and his strong melodic sensibility. It winds up as his most accessible, welcoming record yet. 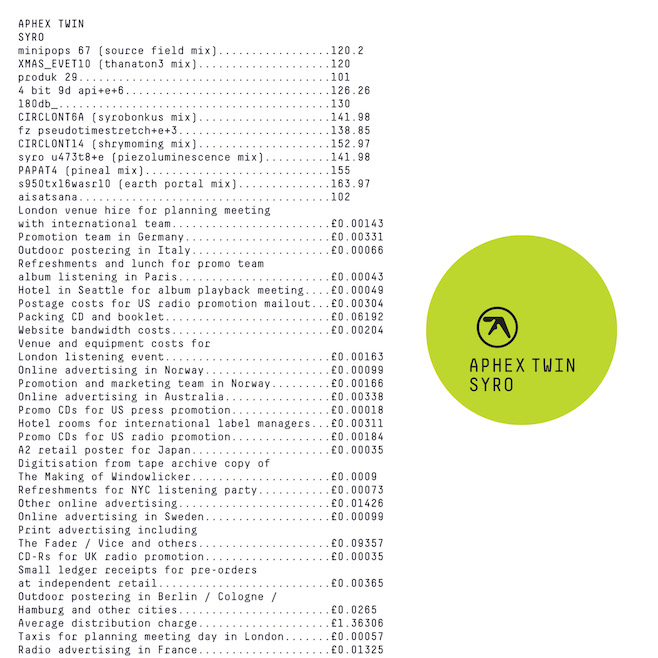 Where Drukqs was expansive and messy, Syro covers just as much ground yet is tight and focused. If there’s any disappointment here, it’s that there’s not much here he hasn’t done before, but that’s so matter because even after years of acolytes, the Aphex style hasn’t lost its luster. In some ways, because technology has improved, it sounds better than ever, with the record grabbing on first listen and revealing intricate manipulations with each play. Lead single “minipops 67 [120.2] (source field mix)” kicks the record off with a virtual tour of Aphex’s many moods, while the slick centerpiece “XMAS_EVET10  [thanaton3 mix]” bubbles along on waves of humming tones, squelching synths, and even a few vocal snippets of James’ family. He’ll get loose and moody with the glitchy chiptune-meets-late-night-techno of “CIRCLONT6A [141.98] [syrobonkus mix],” and he’ll stop for moments of great beauty, like on the fragile piano piece “aisatsana ,” one of James’ simplest, prettiest tracks, that closes everything out. It’s a record that is successful not for having many distinct highlights or how it stakes out new territory. Instead, Syro excels by having a consistently gratifying vision that works just as well in the background as it does up close. The idea that James can return with an Aphex Twin record 13 years later, after pop music’s most prolific decade, let alone electronic’s, and still sound fresh only reaffirms his command of technique and songwriting. It may not be as head-spinning as Richard D. James Album or as masterful as Selected Ambient Works 85-92, but it’s a great record through and through and an easy choice as an entry point for the uninitiated. El Pintor may mean “the painter” in Spanish, frontman Paul Banks’ second language, but it’s also a scramble of “Interpol.” This would seem to signal that the band, now a trio, is ready to mix things up, perhaps taking a cue from the stylistic diversions that bubbled up on the fringes of their eponymous record. Instead, El Pintor reveals that in the past four years—the band’s longest gap between records—the band have lost their bassist but not their identity or sensibility, dwelling in the same seductive shadows they always have. Interpol are often criticized for their singular focus, for how they honed their sound on the brilliant Turn On The Bright Lights, turned up the tempo for Antics, and then haven’t touched the formula much since. (For all the griping about how they ripped off Joy Division in 2002, turns out they’ve got the last laugh: few bands then or now sound particularly like them, proving they were do something more distinctive than their detractors were willing to admit.) If the songwriting is strong, maintaining a style isn’t necessarily a problem. And more than anything, that’s why Our Love To Admire and Interpol are decent but uneven listens: They each offer a sprinkling of tracks that hint at greatness, illustrating that if Interpol just got out of their own way and wrote a great set of songs, they might reach another career peak. El Pintor, on its outset, seems to promise that. It’s punchier; they’ve trimmed the fat that occasionally bloated their recent work, and at 39 minutes, it’s their shortest album yet. The slow-building, uptempo tracks here harken back to Antics, and with the title of “Breaker 1” deliberately referencing “Obstacle 1,” there’s the sense that Interpol are trying to get back in touch with their glory days, even with the loss of Carlos D. The opening gambit of “All The Rage Back Home” and “My Desire” starts things off promisingly too. The first is a fine example of a latter-day Interpol single, complete with Banks repeating a short phrase (this time it’s “I keep falling/maybe half the time”) as the track crescendos in a torrent of sinewy guitar lines, while “My Desire” relishes in the high drama and frustrated catharsis from Turn On The Bright Lights that’s been in short supply since. No, they never reach the heights of their best work here, yet if these songs are more “Take Me On A Cruise” than “PDA,” so be it. Interpol have always had their fair share of worthy deep cuts, and the rest of El Pintor follows the same pattern, feeling more like a solid, if not immediate, collection of B-sides. Some of those, like the insistent “Anywhere” and the thundering “Ancient Ways” feel comfortable and confident in the way that only a band that’s been working for this long can manage, not exactly fresh but still pretty damn exciting. Plus though the music is still markedly gloomy, Daniel Kessler’s sprightly, high-pitched riffs on tracks like “Same Town, New Story” and “My Blue Supreme” help the record come off a touch brighter, which is some sort of win too, I suppose, because it gives the record a distinctive flair among its predecessors. Again, there’s nothing here Interpol haven’t done before, but they haven’t done it this consistently well for ten years, so there’s a lot of silver lining, even if the highlights aren’t as high. If Interpol can no longer surprise, at least they can still satisfy on a small scale. Enter your email and subscribe to Notes On Notes to get notified every time there is a new review or update!! !